Every autumn in New York, leaves fall, grass turns brittle, and people are reminded of death. There are the spectacles of Halloween and Day of the Dead, and more personal considerations of mortality. 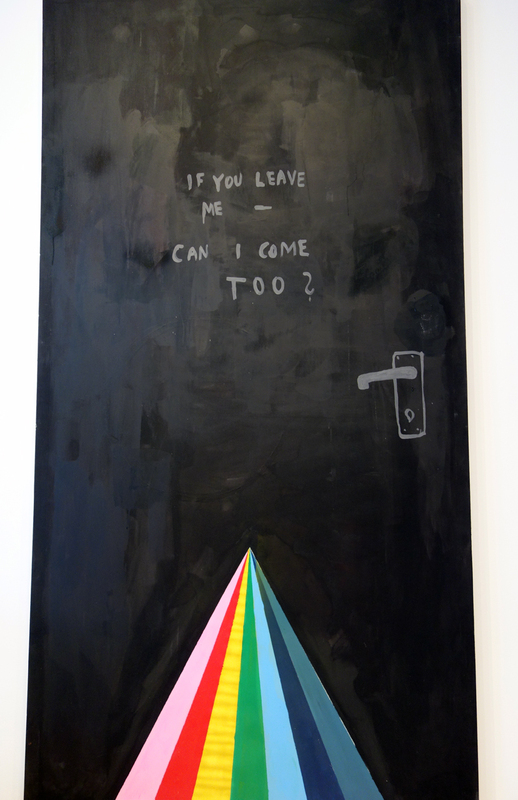 If You Leave Me Can I Come Too?, which opened in October at Hunter East Harlem Gallery, features works by 12 artists that examine what happens when the finality of life is acknowledged. My mom once told me that her fear of death gave a little of its grip with children. She said that to comfort me and let me know it will get easier. But now seven years later, after a year of tests and doctors groping every inch of me, I know we might never have that comfort. It is not a guarantee, or even likely, that I will be passing anything on. So this is what we have. Just us and we are going to end. Throughout If You Leave Me Can I Come Too? are attempts to make individual meaning of death. 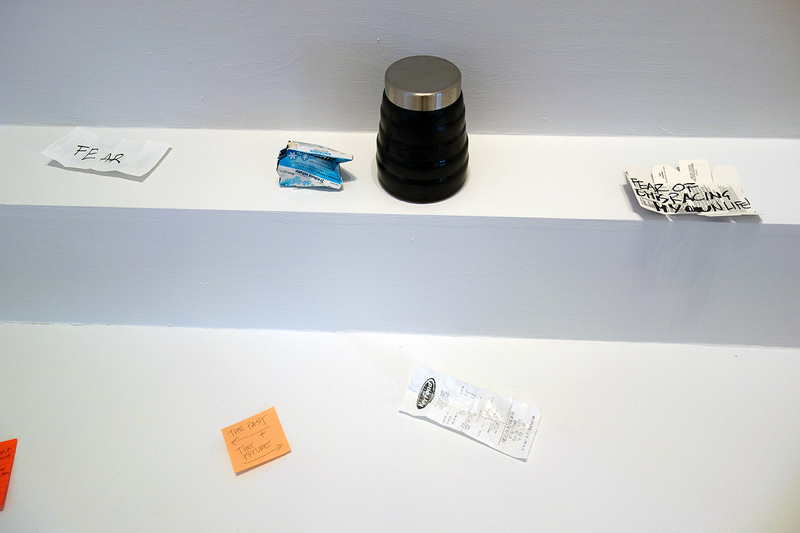 Justine Reye’s “The Last Things” (2010) has four quiet photographs of the possessions belonging to her late uncle, arranged as he left them a year before, while Friedrich Kunath’s “Untitled” (2003) gives the exhibition its name, with “If You Leave Me — Can I Come Too?” scrawled on a painted door that can never be opened. Justine Reyes, “The Last Things,” four prints, 30 by 40 in. 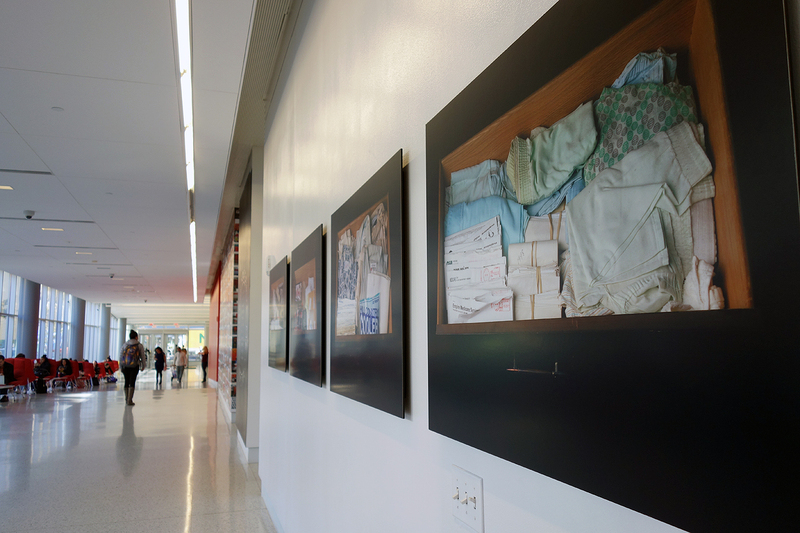 Others have a broader, more ambiguous reach, like Xaviera Simmons’s “Superunknown (Alive in the)” (2010), a grid of 32 photographs that fills one entire wall with images of fleeing migrants on boats, the threat of death unseen on all sides. 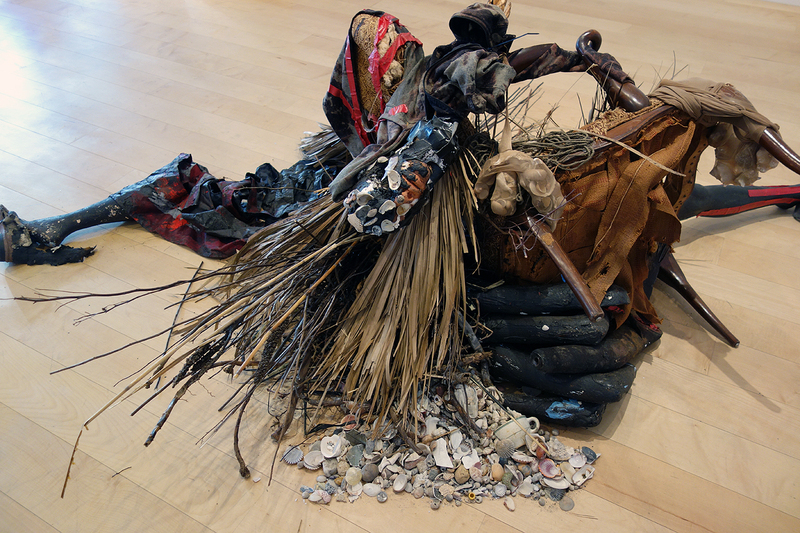 Abigail DeVille’s “Untitled (Till, Martin, Garner, Brown)” (2015) is made of heaps of debris found around East Harlem combined with palms from Charleston, South Carolina, to form a splayed, human-shaped tribute to the black men in the piece’s title, all victims of racially-motivated killings. 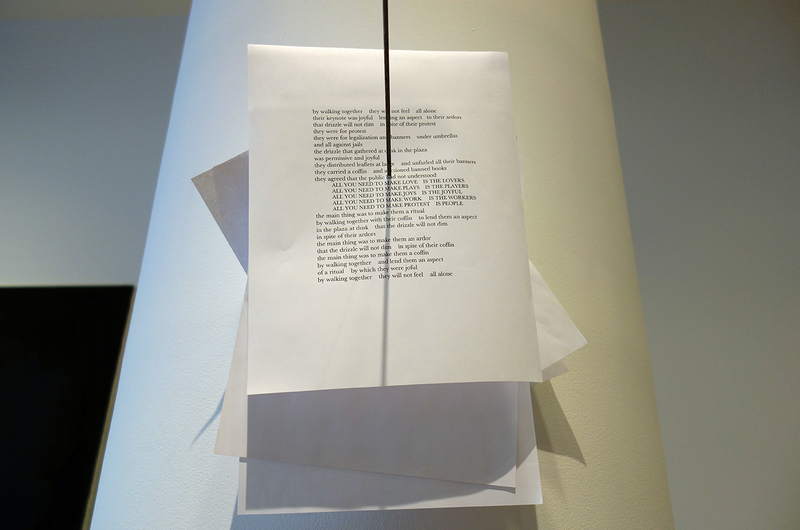 On an altar alongside it, visitors can leave objects at Natasha Wheat’s “Ascending a Staircase” (2015), which will all be cremated together and held within a ceramic urn. 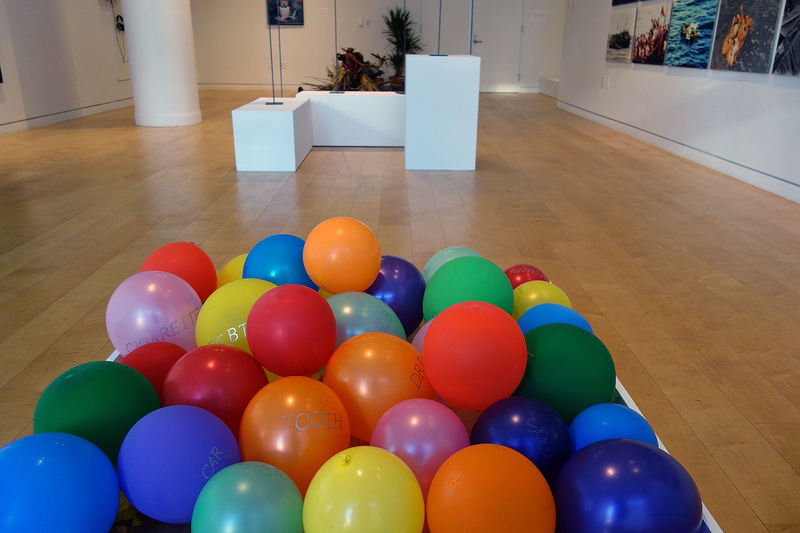 It’s not a light exhibition by any means, as Seestadt’s grounded balloons make clear from the beginning. And there’s something to be said for having the visceral reality of death, with all its decay and bones, absent except in Javier Castro’s “Fosa Común” (2015). The video follows the workers who transport skeletons from a Havana graveyard to an ossuary in an ongoing, quotidian ritual. 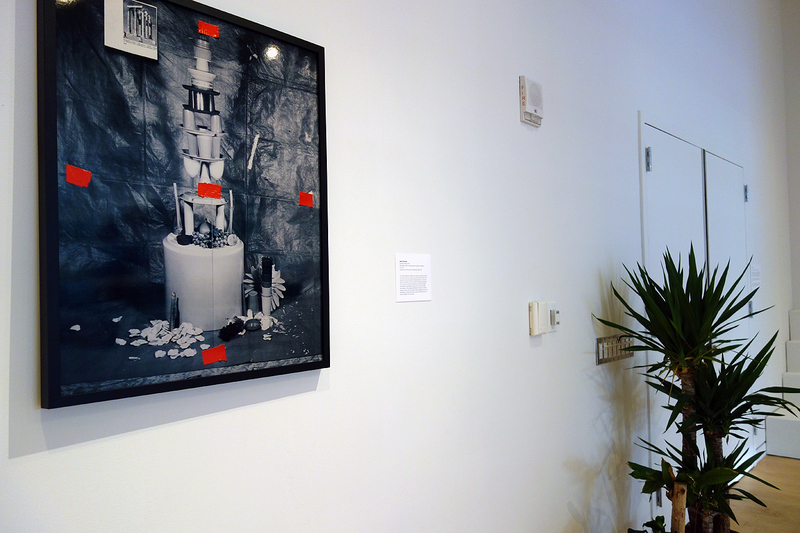 Sara Cwynar, “Corinthian Temple” (2014), chromogenic print on metallic paper mounted to Plexiglas, 30 by 24 in. If You Leave Me Can I Come Too? 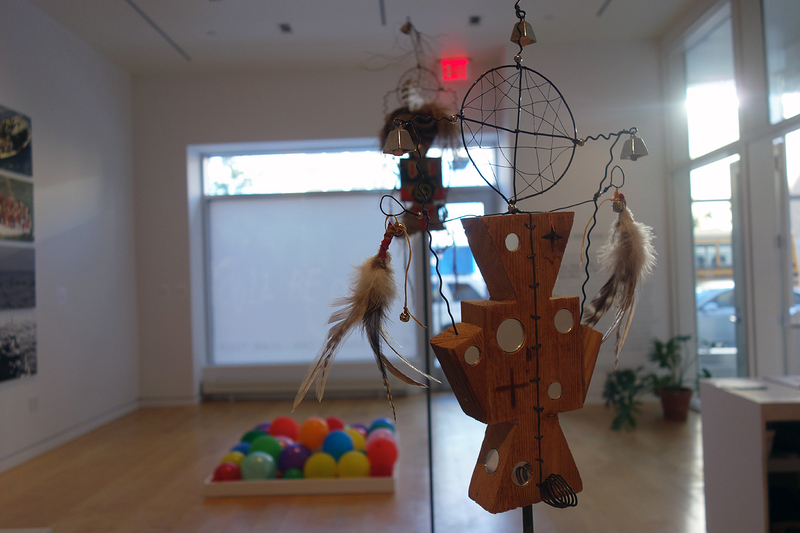 continues at Hunter East Harlem Gallery (Hunter College Silberman School of Social Work, 2180 Third Avenue at 119th Street, East Harlem, Manhattan) through January 23, 2016.